Two-Panel Hinged Altarpiece, Travelling Icons.  What is a Diptych? In fine art, the term "diptych" - whose name derives from the Greek words di (two) + ptyche (fold) - commonly describes a pair of tablets/panels made of wood (sometimes covered in wax) or more rarely ivory, which are hinged together to open like a book. A type of devotional Christian art, which was occasionally made into an altarpiece, diptychs were a popular form of medieval painting and maintained this popularity during the Renaissance. 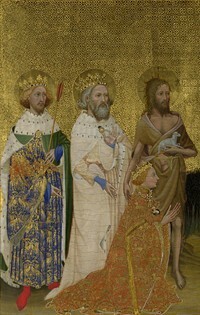 When it came to use as an altarpiece, however, the two-panel format was not as popular as the larger three-panel format (triptych), or the multi-panel format (polyptych). Wax diptychs were originally used as writing tablets for secular purposes (example: consular diptychs). Notes or drawings could be made in the wax, by a metal stylus, and could be later smoothed over and reused. Later, diptychs were used in early Christian art as personal items, and also to record living and deceased members of the local church congregation. As personal devotion items, diptychs became widespread during the era of Byzantine art during which they were known as travelling icons. 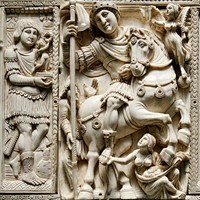 See: Christian Art (Byzantine Era) (c.400-1200). In a way, when used for personal devotional purposes, diptychs resemble smaller, static versions of Books of Hours, like the Tres Riches Heures du Duc de Berry (1413), created in the International Gothic style by the Limbourg Brothers at the French court in Burgundy. Their use spread to Italy during the 13th century, and they were a regular feature of Italian Renaissance art. 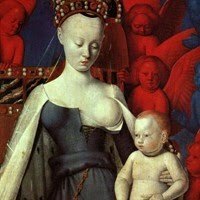 They were also widely used for religious paintings during the Northern Renaissance in Flanders (c.1400-1580), among Flemish painters like Jan van Eyck (1390-1441), Rogier van der Weyden (1400-64), Hans Memling (c.1433-94) and Hugo van der Goes (14401482). Typical subjects for this personal form of Biblical art, included portraits of the Holy Family and scenes from the Bible, as well as secular portraiture. A common format involved a right-hand panel depicting a Madonna and Child, with a left-hand panel showing a portrait of the owner in prayer, next to his portrait saint. Diptychs are occasionally produced today by twentieth century painters for works consisting of two paintings that are not physically joined, but are displayed side-by-side as a pair.  Barberini Diptych (c.500-550 CE) Louvre Museum, Paris.  Wilton Diptych (1399) National Gallery, London.  Werl Altarpiece (Diptych) (1438) Prado Museum, Spain.  Crucifixion and Last Judgement (1420-25) Metropolitan Museum, NYC.  Virgin and Child Standing in a Niche (1430) Kunsthistorisches Museum.  Melun Diptych (1450-55) Koninklijk Museum; Gemaldegalerie, SMPK, Berlin.  Portraits of Federico da Montefeltro and Batista Sforza (1465) Uffizi.  Countess' Ordeal by Fire Before Emperor Otto III (1473) Brussels.  Deposition (1480) Staatliche Museen, Berlin.  Portrait of Benedetto di Tommaso Portinari (1487) Uffizi, Florence. Left-hand half of the diptych.  Four Apostles (1526) Alte Pinakothek, Munich.  Portrait of Luther and Wife (1529) Uffizi, Florence.  The Third of May 1808 (1814) Prado, Madrid.  Marilyn Diptych (1962) Tate Modern, London.  The Last Thing I Said To You Is Don't Leave Me Here (2000) Saatchi Gall.  For more about devotional artworks, see: Homepage.